1. Remove absolutely all residue with nail polish remover. Acetone can be very drying for the nails, so stick to a non-acetone remover like Nailtiques Non-Acetone Remover, £6.34 if you can. 2. Apply Nailgirls Super Base to ensure a long-lasting, colour-true and even application of nail colour. This is especially important if you’re using a dark or especially vibrant colour, as these can often stain the nail bed. Let this dry for 60 seconds. 3. 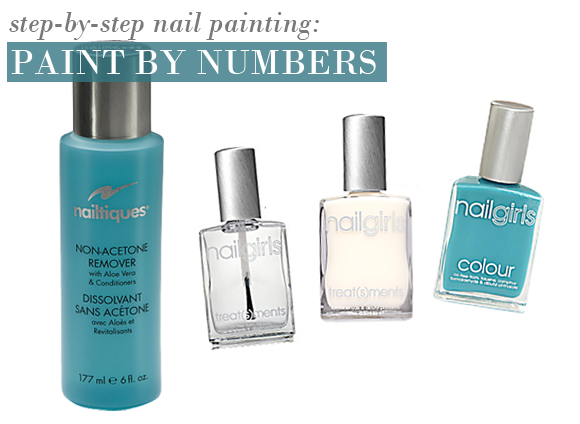 Apply your chosen nailgirls colour. I’m loving blues at the moment, so I’d plump for Blue #6, a gorgeous creme shade that looks great on both fingers and toes. Allow to dry for 60 seconds, and then repeat the process. 4. Remember: re-dip your brush before painting each nail to prevent colour streaking, and to ensure the most even application. 5. Once dry, apply the Nailgirls Super Finish top coat for incredible shine and protection. 6. Air dry your way to the perfect paint finish. 7. When you think that they might be done, very gentle touch two nails together. When you hear that tell-tale ‘ching’ sound2, then you’re all done! Discover the rest of the ‘4 free’ Nailgirls range right here at Escentual. im a nail tech and use 3 free products as much as possible and this is by far the best top coat I've ever used, polishes last all week, and no nasty chemicals, not too thick and dries the polish in about 5 mins, it beats the big companies hands down. love it! This entry was posted on Thursday, July 14th, 2011 at 3:00 pm and is filed under Make-up. You can follow any responses to this entry through the RSS 2.0 feed. You can skip to the end and leave a response. Pinging is currently not allowed.